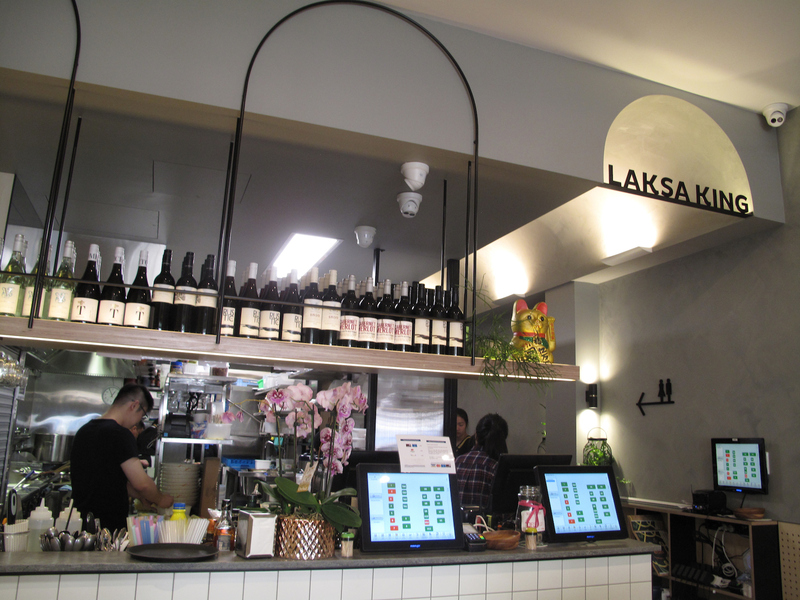 Laksa King Kitchen, 328 Racecourse Road, Flemington. 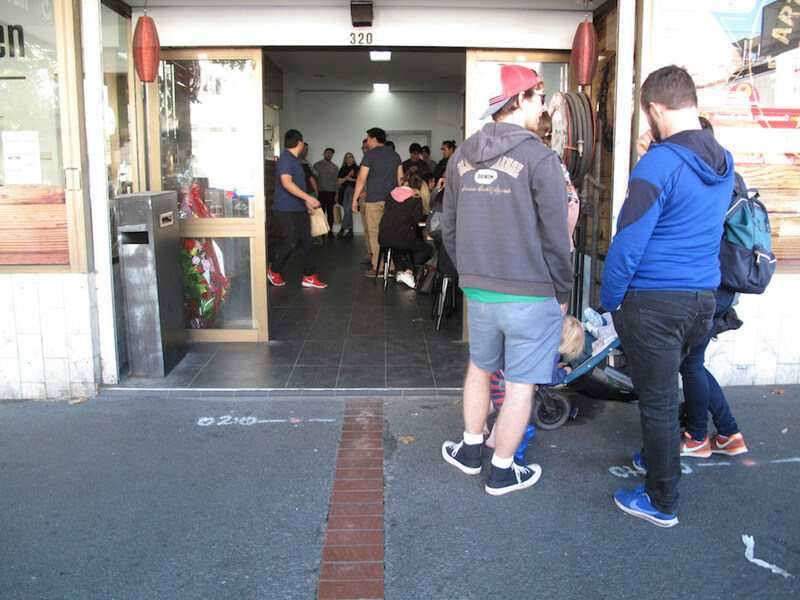 A regular sight that bemuses us when where seeking a feed in Flemington is people queuing up for a table at Laksa King. On the footpath outside on Pin Oak Crescent. And sometimes, even, in the rain. Such is the allure of the Laksa King name. 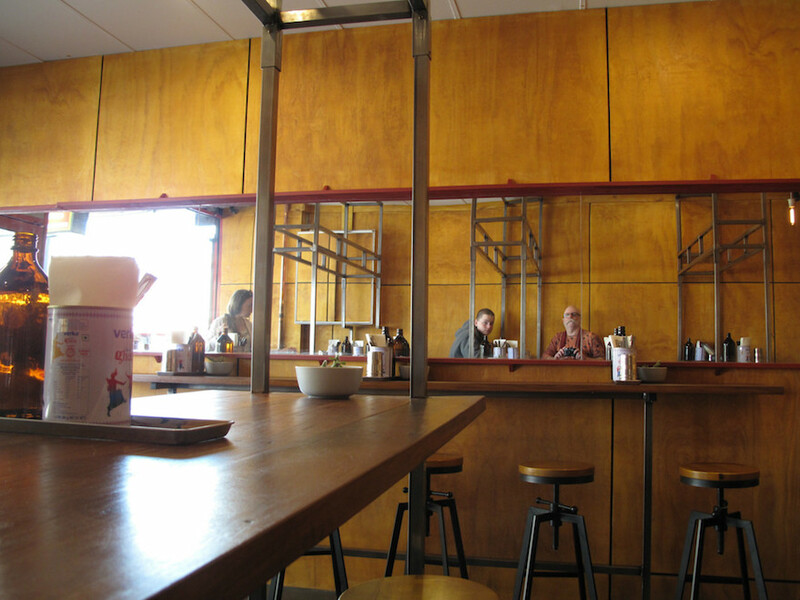 But the place’s popularity lends it a somewhat rushed, impersonal vibe – and we’re not alone in thinking that. Good luck to them, but the CTS ethos usually leads us to going where the crowds aren’t. And where the food is as good, if not better. 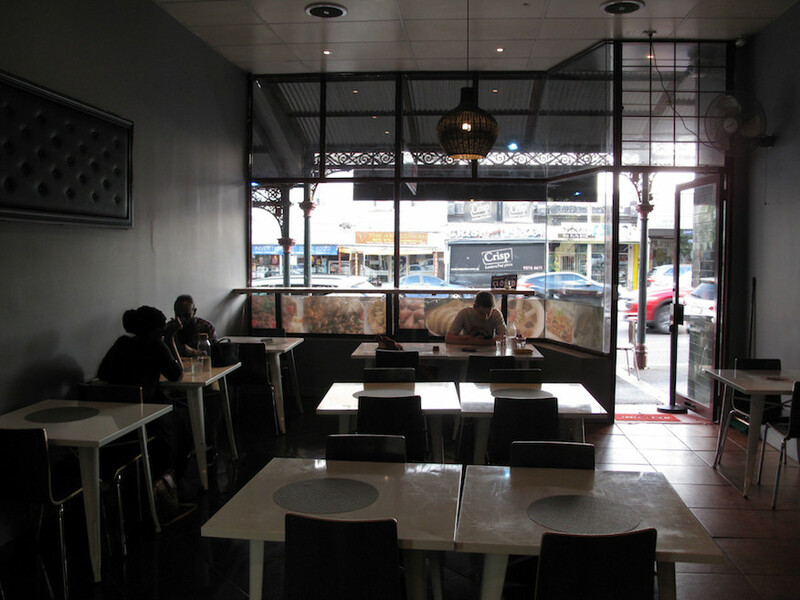 In Flemington and for Malaysian, that invariably means M Yong Tufu – a place we dearly love. 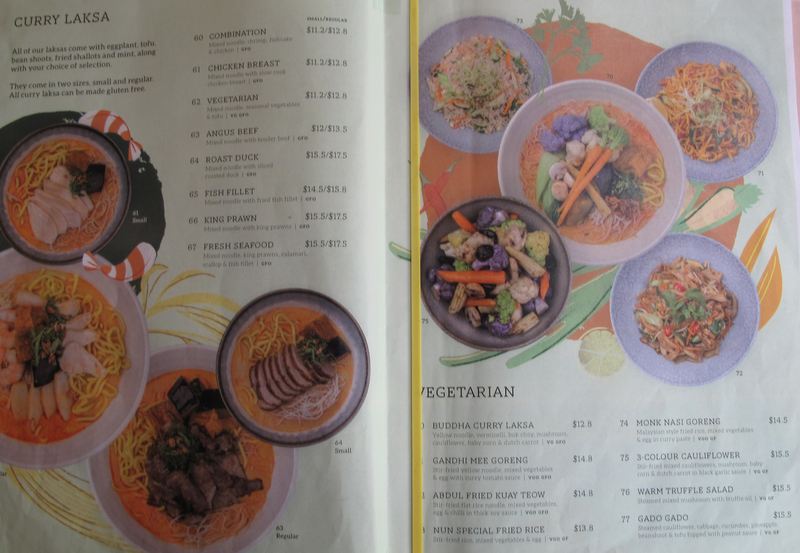 But we are happy and keen to check out the new Laksa King family establishment – Laksa King Kitchen on Racecourse Road. 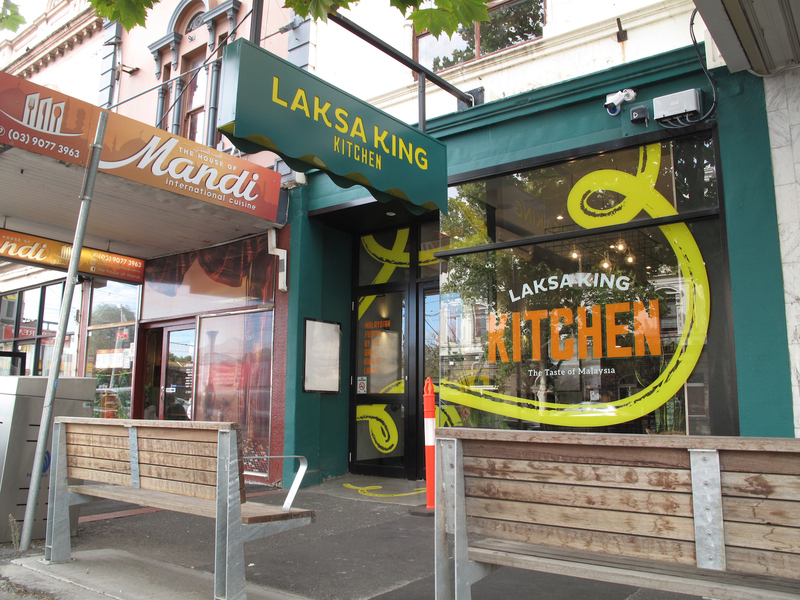 This is actually the second Laksa King Kitchen – there is another at Westfield Southland Shopping Centre. 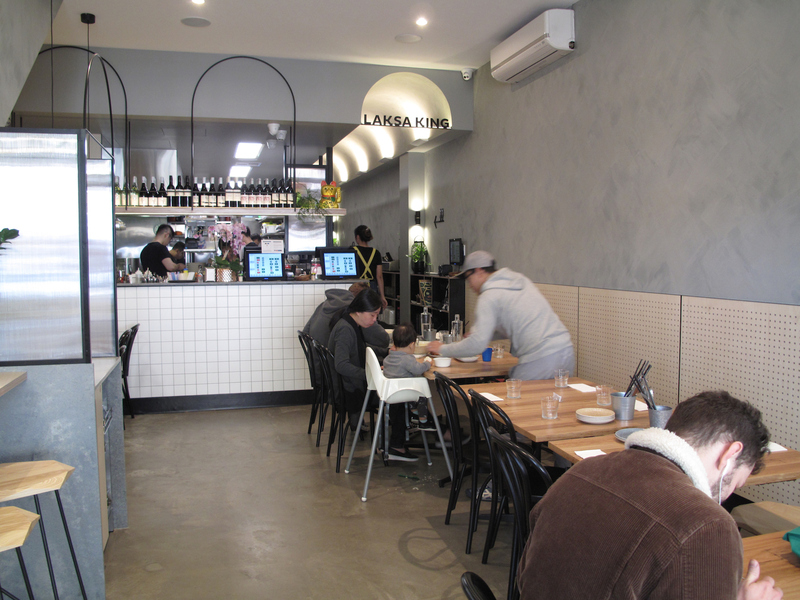 The new Laksa King Kitchen in Flemington boasts a chic-but-small dining area, though there is more seating upstairs. The staff are keen, happy and all a-bustle. 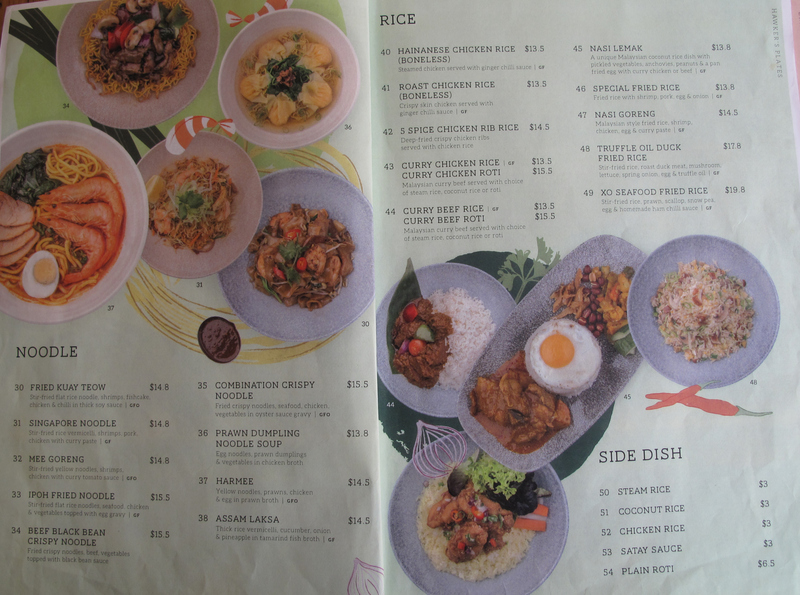 The menu (see below) is a solid gathering of Malaysian staples divided into small/big bites, noodles, rice dishes, laksas and vegetarian. 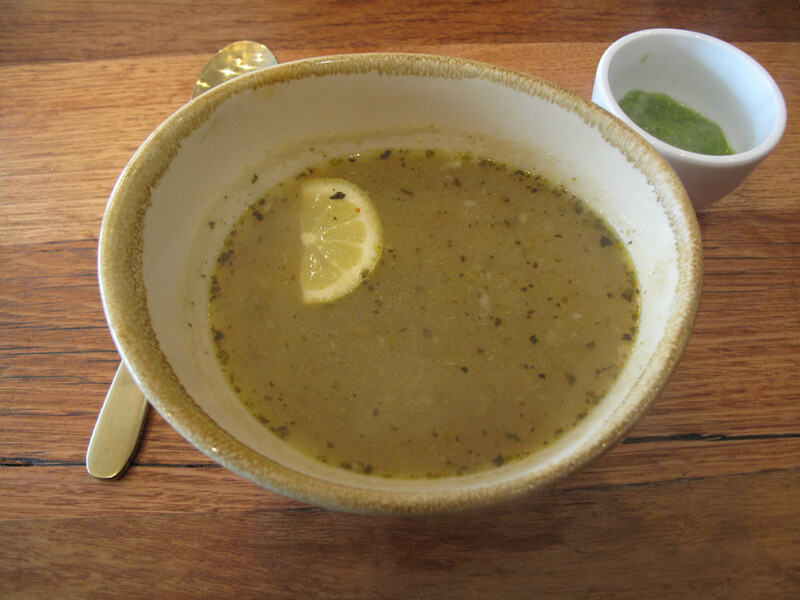 There is a nifty twist – laksas are offered in two sizes. This makes good sense, as regular laksas are always a big meal. Not that we can envisage a day when we would order the smaller size! 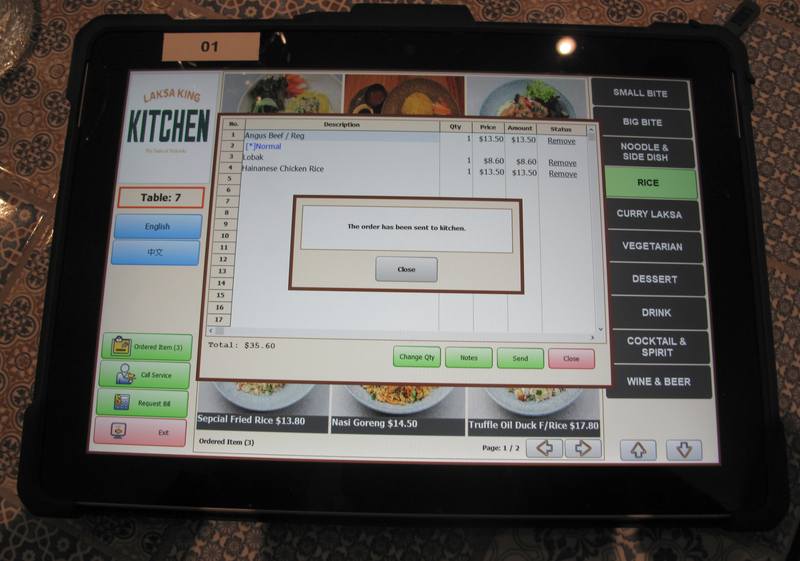 Selections can be ascertained using the printed menu or on the laptop at each table, but the actual ordering is done via the latter. Bennie and I share a starter and have a bigger dish each. Lobak ($8.60) is less gung-ho on flavour and crinkly beancurd skin than we would like, but it’s a fine beginning that delivers us three porky chunks each. In a fine break with boring CTS practice, it is Bennie who orders a laksa – in this case, the bigger version of the angus beef outing ($13.50). It’s a big an handsome bowl-full. 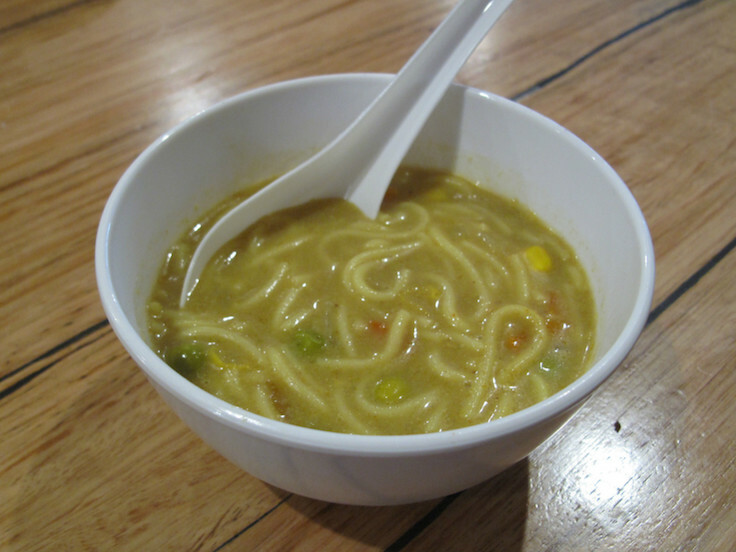 But he is so-so about the laksa as a whole – perhaps a higher spice level may have won him over? He does give, however, an enthusiastic 10/10 for the many tender beef chunks. 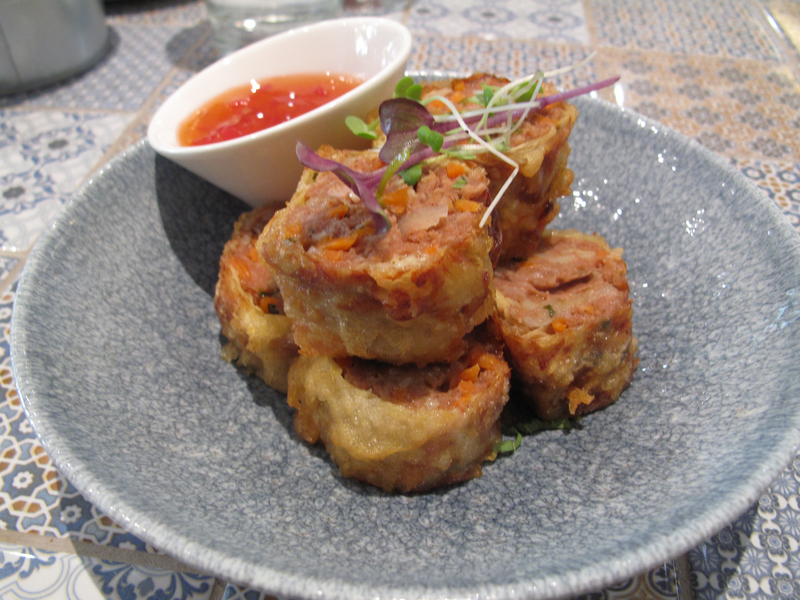 And I get to try one of the eggplant pieces – it is wonderfully luscious and memorable. 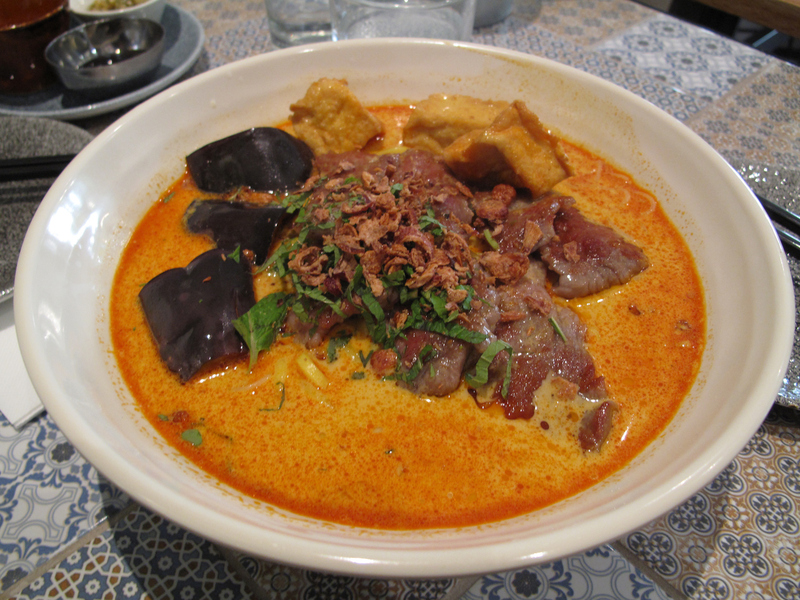 But still … for us, when it comes to laksa hereabouts, M Yong Tofu will remain our go-to. 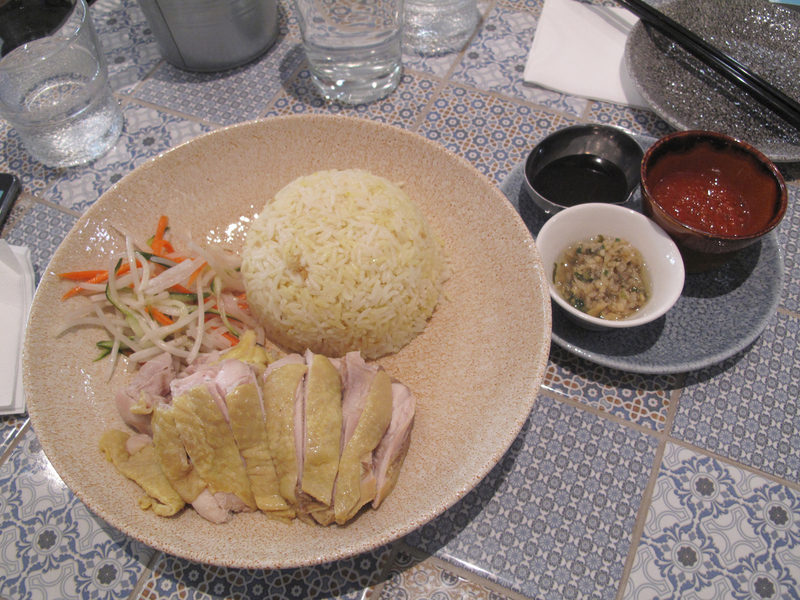 That leaves me ordering the Hainan chicken rice $13.50). The photos of the dish didn’t really inspire and that unease increases when I realise my rice meal will be eaten without the usual bowl of chicken soup on the side. But all is forgiven from the first mouthful of perfectly ginger-perfumed rice and onwards. This is a triumph and one of the best of this personal favourite I’ve had for a long time. There’s a lot of chook – it’s double layered in the photo above – and it’s tender and expertly boned. The ginger mash, chilli sauce and soy accompaniments are excellent and in generous quantities. And the wilted bean sprout/veg offering is likewise top notch. My mouth is doing a high-stepping boogie as we depart. 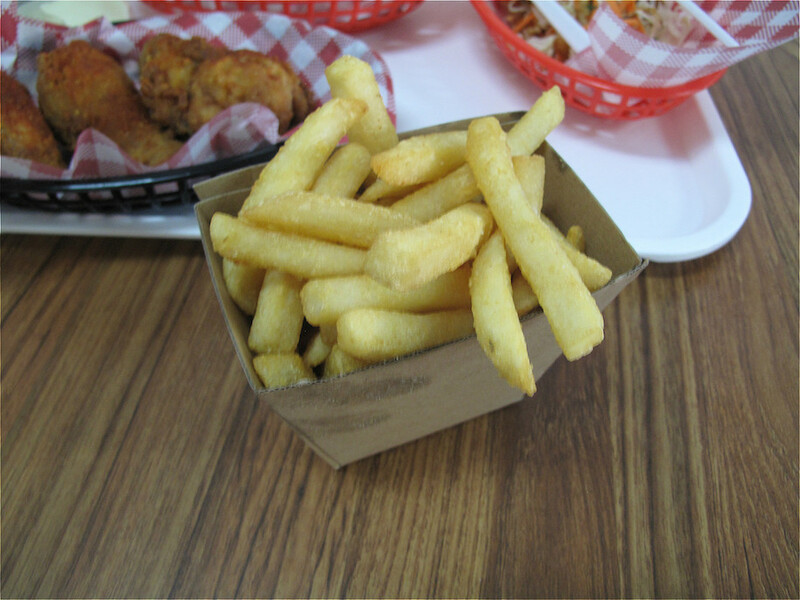 The Art Of fried Chicken, 320 Racecourse Road, Flemington. 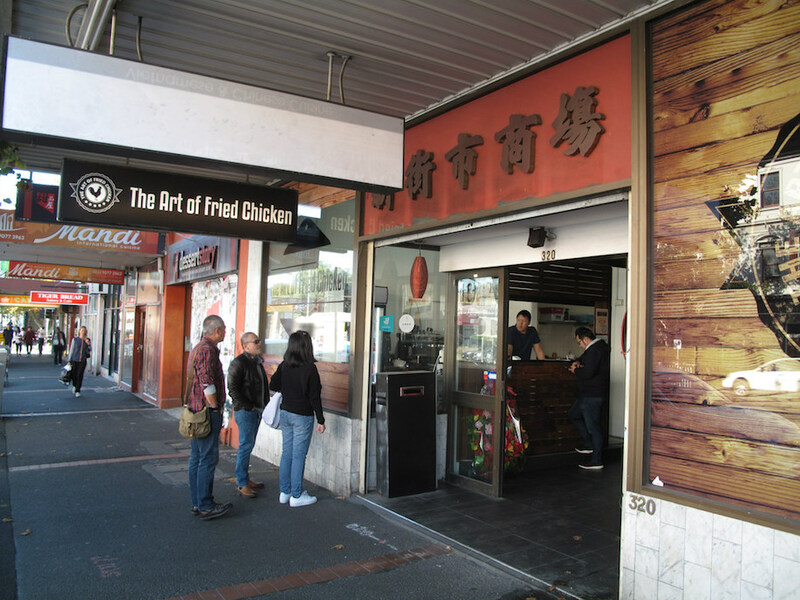 The Art Of Fried Chicken has taken over two shopfronts that have long been empty since the days they housed two Asian eateries. 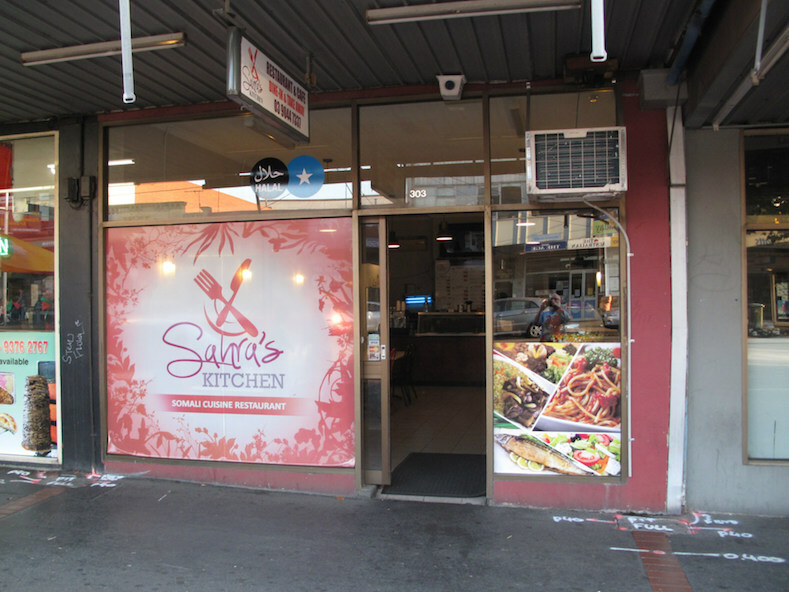 They – and the walkway between them that used to lead to the original Laksa King – have been turned into a single premises. TAFC is a food truck operation putting down bricks-and-mortar roots, though I suspect the building as a whole is destined for development somewhere along the way. 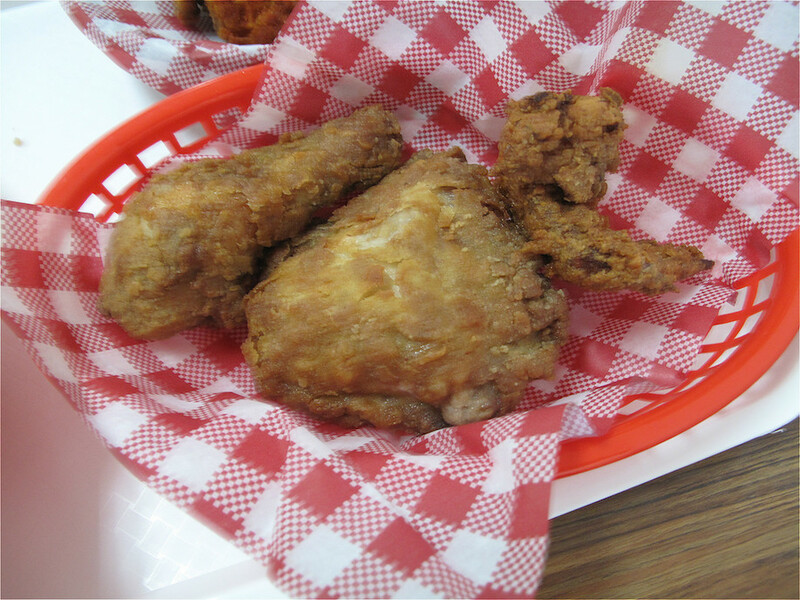 It’s fitting, then, that this new fried chook joint has something of a makeshift vibe about it – less restaurant and more food-truck-without-wheels, with rudimentary seating. As well, we’re happy to give them some leeway in terms of assessment as we are visiting in the opening hours of their opening day. Such is not ideal for CTS story purposes, of course, but that’s how the timing has worked out – post-Saturday morning kung fu, it’s been an easy and choice option. 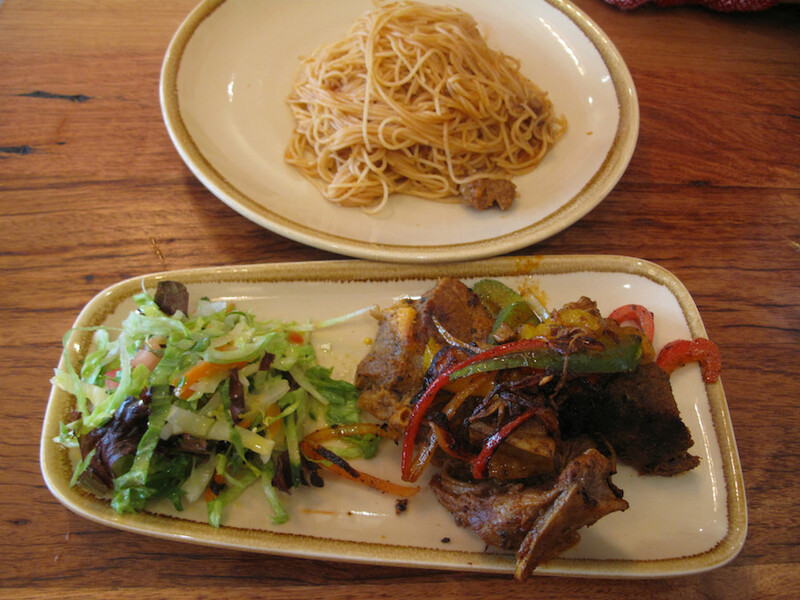 We arrive about 12.20pm and are served quickly. About 10 minutes later, the place is a whole lot more crowded; the word is out. We ignore the opening day $1 wingettes and rib spcecials. 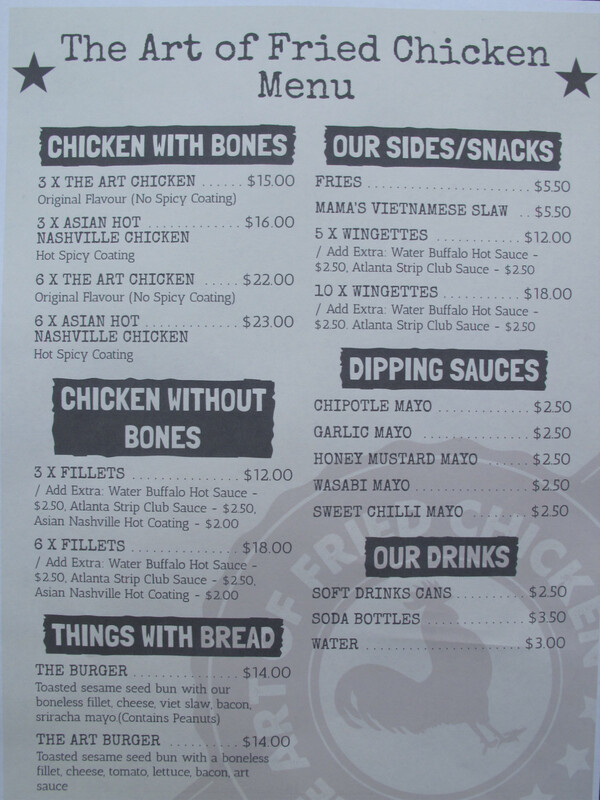 Of the menu listings (see below), we ignore those under the Things With Bread and the Chicken Without Bones headings. Actually, we are bemused anyone would order the latter. Why order breast when you can order Chicken With Bones? 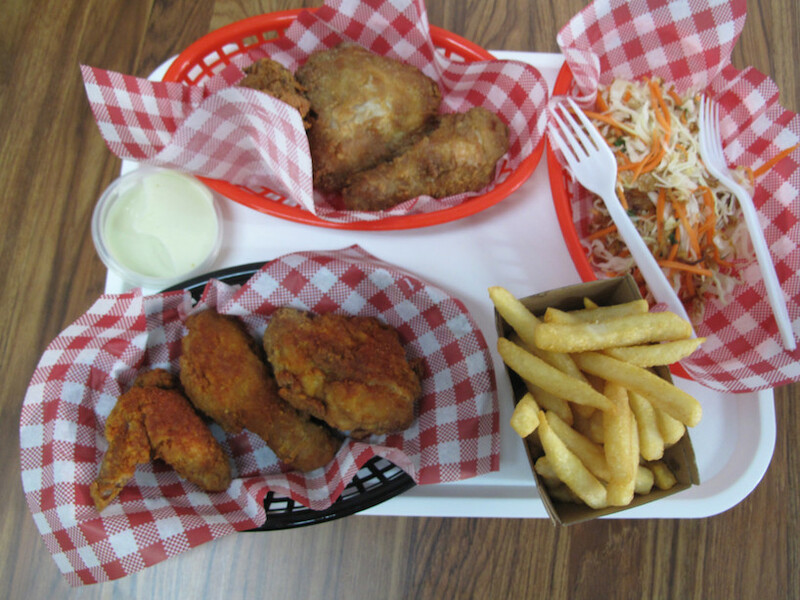 Three pieces of regular Art Of Chicken ($15, above photo). Three pieces of Asian Hot Nashville Chicken ($16). Even the chunkier meat pieces are juicy (or at least not dry), though inevitably it’s the bone-dominated items that are the most tasty. Bennie is disappointed at the mildness of the spice hit in the Nashville poultry, though the spicing appears to be a bit random, as the wing I have gives me a right nice glow. He rates the chips highly. Myself, not so much; they could, IMO, be hotter and less greasy. 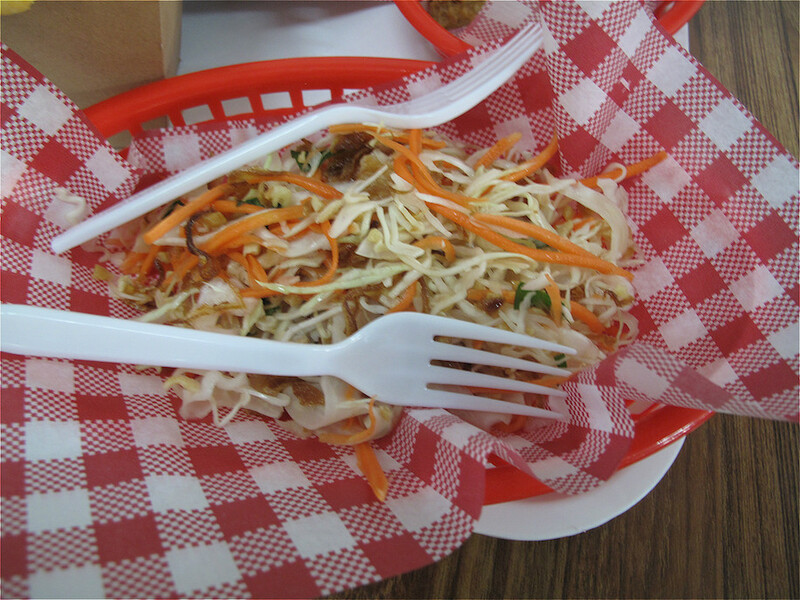 Perhaps best of all is the Viet slaw – it’s excellent. If only more chicken places, of all kinds, took this route with their slaw offerings! 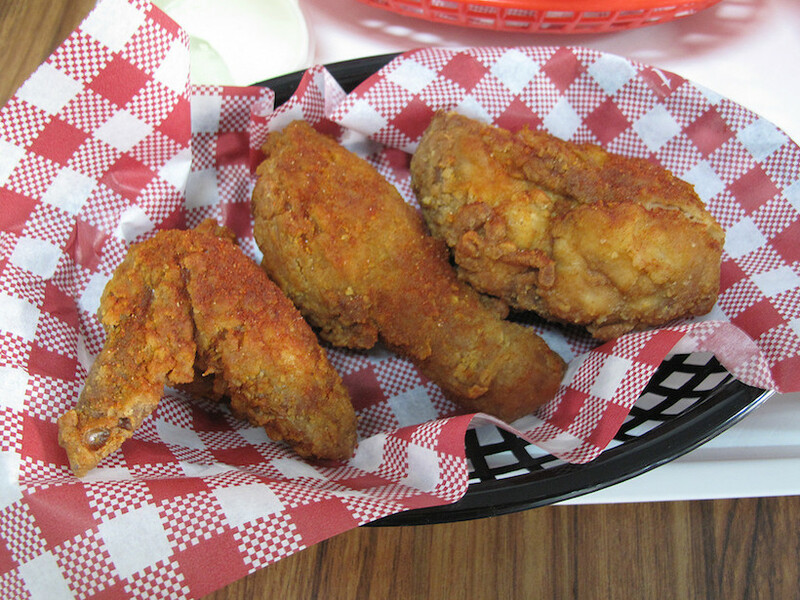 The Art Of Fried Chicken is destined to be a Flemo hit. Check out the Art Of Fried Chicken website here. 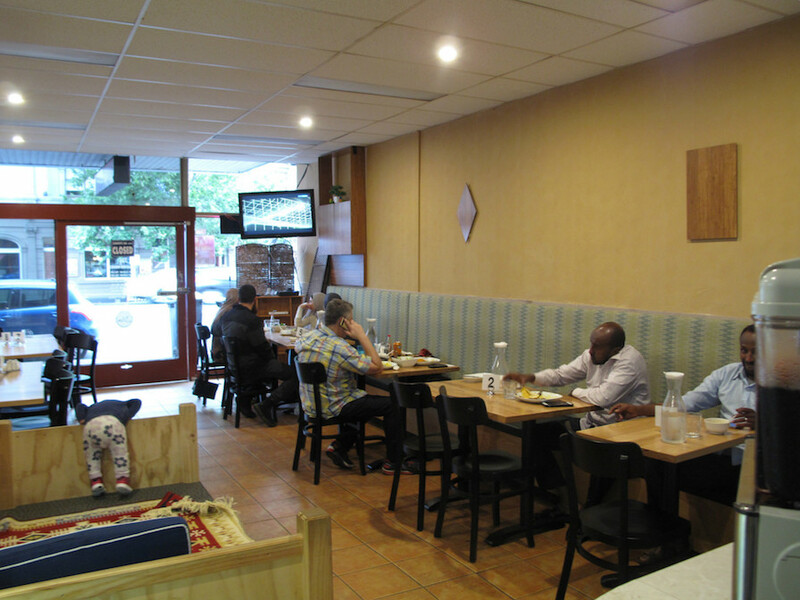 Somali Dish, 264 Racecourse Road. 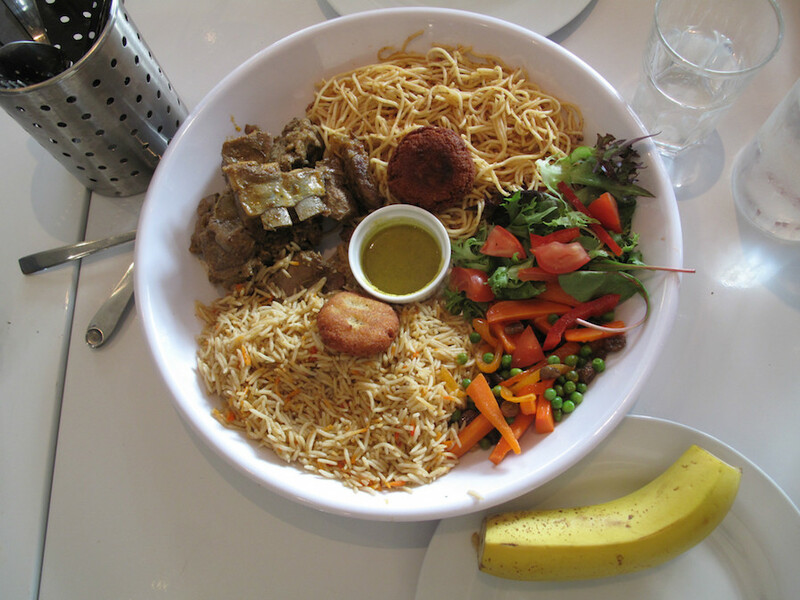 When it comes time – in about a week or so – to collate the now traditional round-up of this year’s CTS highlights, there’s no doubt the Somalian food of Racecourse Road will be right at the top of the list. It has given CTS – including Bennie and myself and various friends along the way – a lot of pleasure. 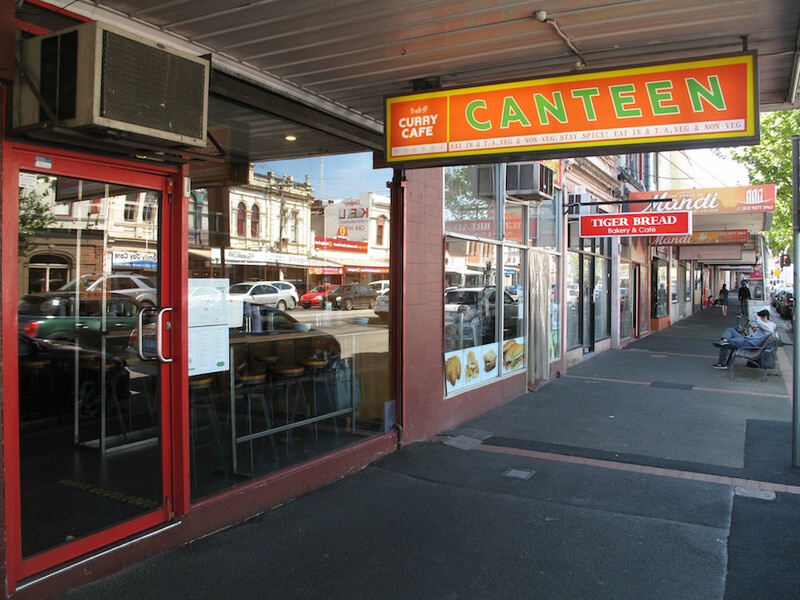 And now it seems this fabulous community of restaurants is on the cusp of richly deserved recognition beyond the local neighbourhood and even the inner west, with a Melbourne Food & Wine Festival scheduled for New Somali Kitchen. 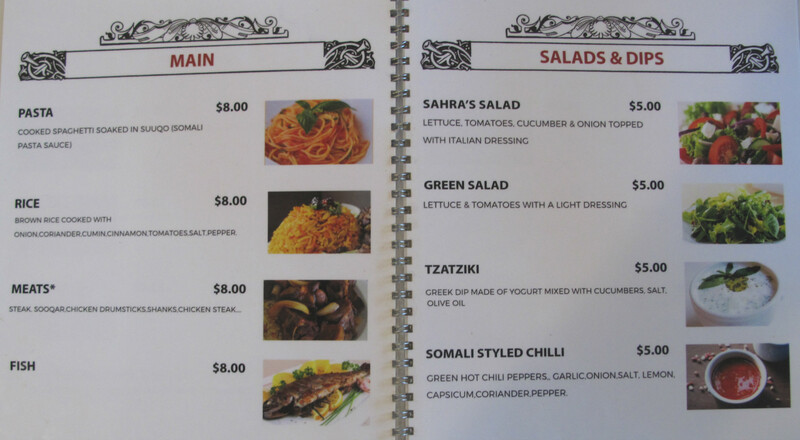 In the meantime, what could be better in terms of building on the Somalian buzz than a new eatery? So Bennie and I are only too happy to step into the latest arrival, Somali Dish. It’s run by another husband-and-wife team, Ahmed Qahira and Sadia H Abdi, and is situated down towards the Quiet Man end of the strip. I enjoy talking with Ahmed, whose pre-restaurant life seems to have been largely involved with community service of various types. And he seems to enjoy our enthusiasm for and interest in the food being laid on here. And terrific it is, too. This classic federation-style platter costs us a grand total of $13 each and we love it to bits. 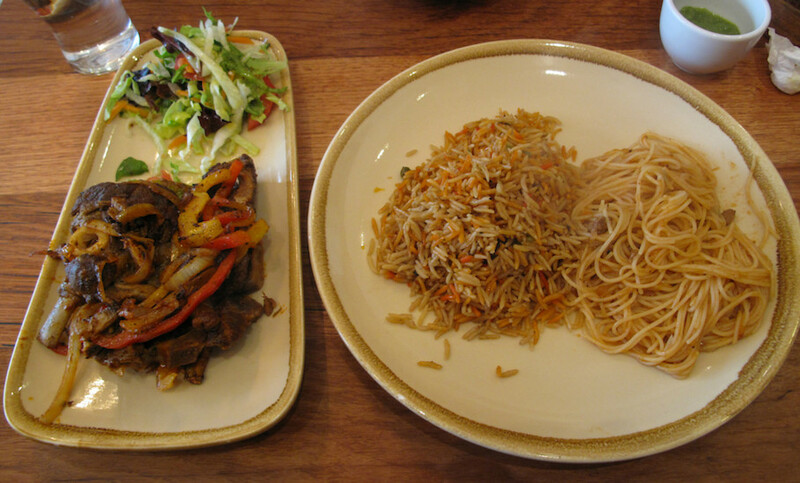 The rice is brilliant in the Somalian way, while the pasta sauce is even drier the usual with crumbly (but lovely) meat. A super jumble of peas, carrots, onion and capsicum is abetted by fine salad. And the lamb is all yummy and comes from the bones very easily. We’re even served a couple of those sponge-like Somalian falafels. 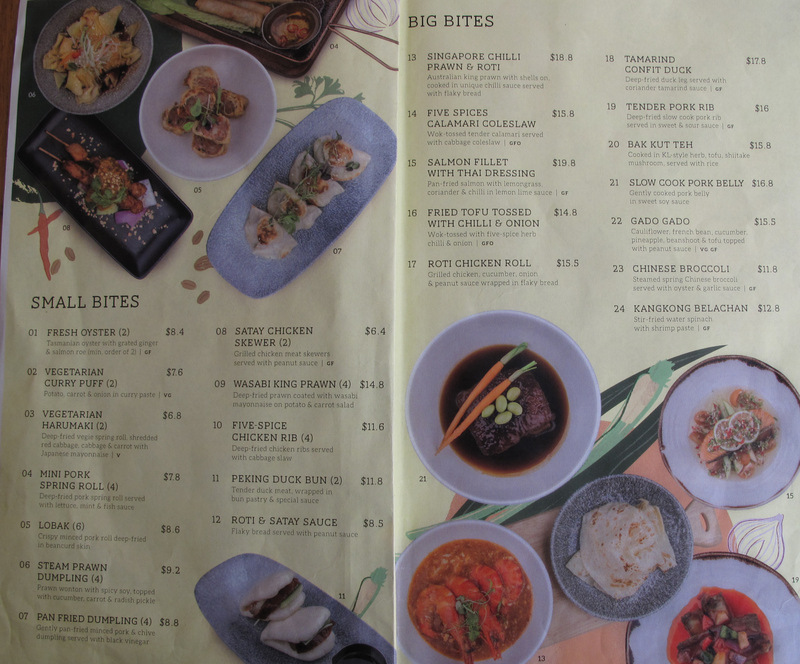 This crew is just getting started, really, and in time the fare here will hopefully mirror the photos adorning the frontage, which portray – beyond our rice offerings – a range of snacky things and even lasagne. 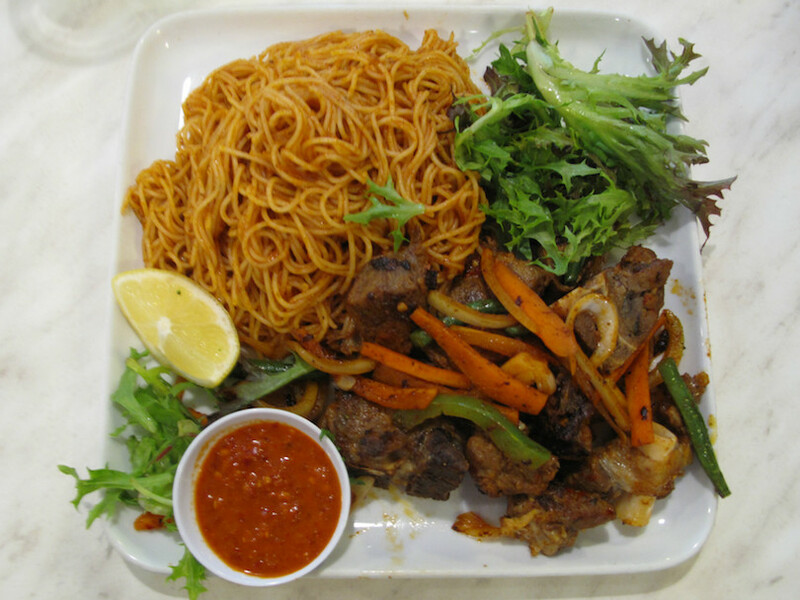 Eating at Somalian restaurants involves a similar dynamic to chowing down at, say, the Vietnamese eateries of Footscray or St Albans. 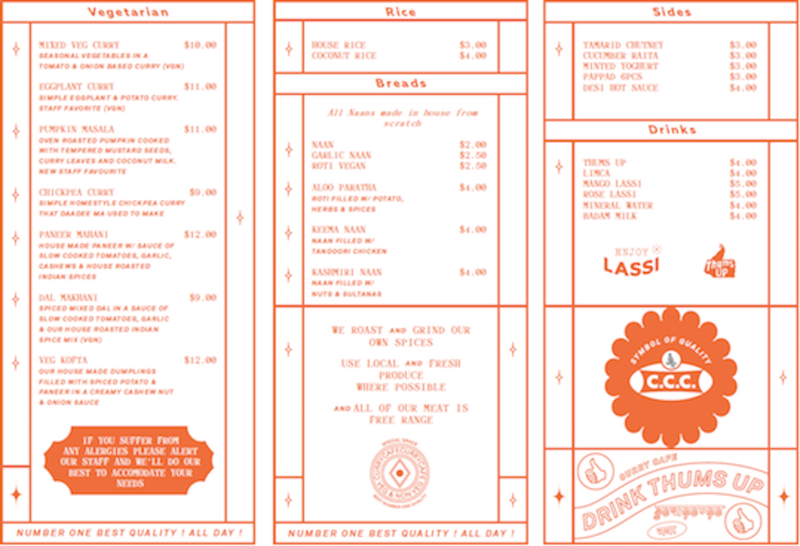 Many places have similar – even identical – menus. But within those parameters, there can be wonderful worlds of variation and subtle differences. 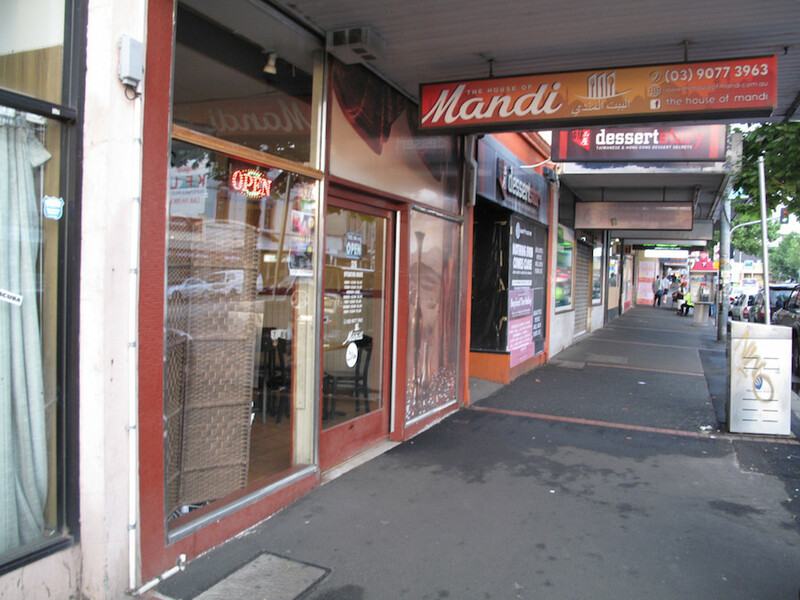 For instance, the complementary soup at House of Mandi enjoyed at the first of two CTS visits is quite different from those offered elsewhere on Racecourse Road. 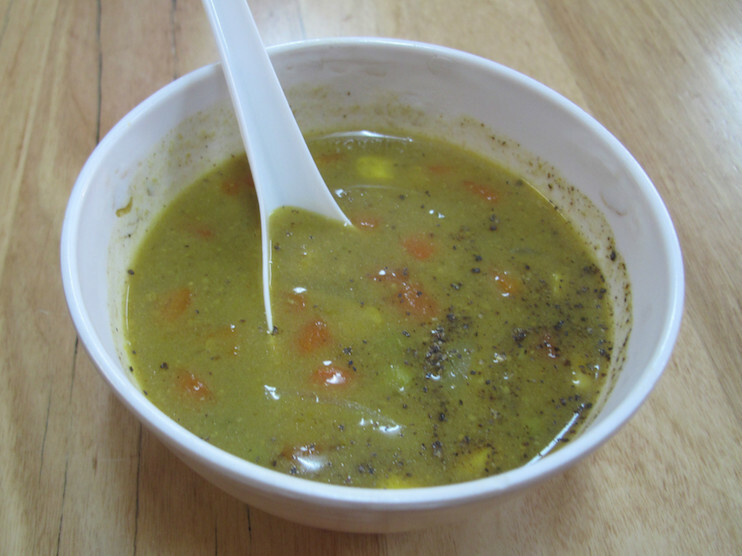 Instead of a mostly clear and tangy lamb broth, here is served a slightly thicker brew, stuffed with not just the expected carrot but also peas and corn, and seasoned – I’m guessing – with a good curry powder. Different – but just as good. 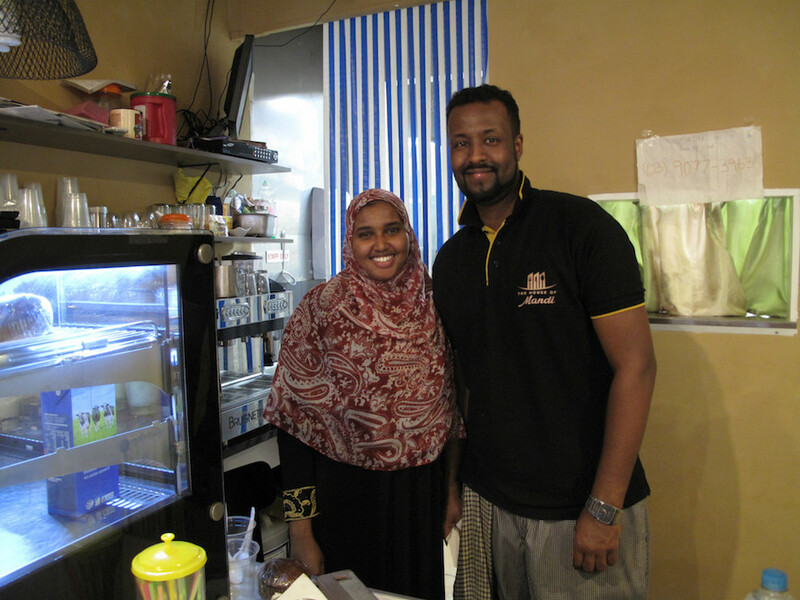 House of Mandi has been running for about a year and is under the guiding hand of two husband-and-wife teams – Abdirahman Abdi and Fatuma Yussuf (above), and Yusuf Rabi and Amina Sirat. The plain facade (see photo at bottom of story) belies the rather nicely elegant interior and friendly vibe inside. Those subtle differences come to the fore with this marvellous meal in the “federation” style. The name is a holdover from colonial days and, in the food sense, means the combination of both pasta and rice. Here, the rice is laced through with carrot strands and studded with sultanas and whole chick peas. The basto is cooked in a typically post-al dente fashion and served with a dryish tomato sauce with some minced meat on board. 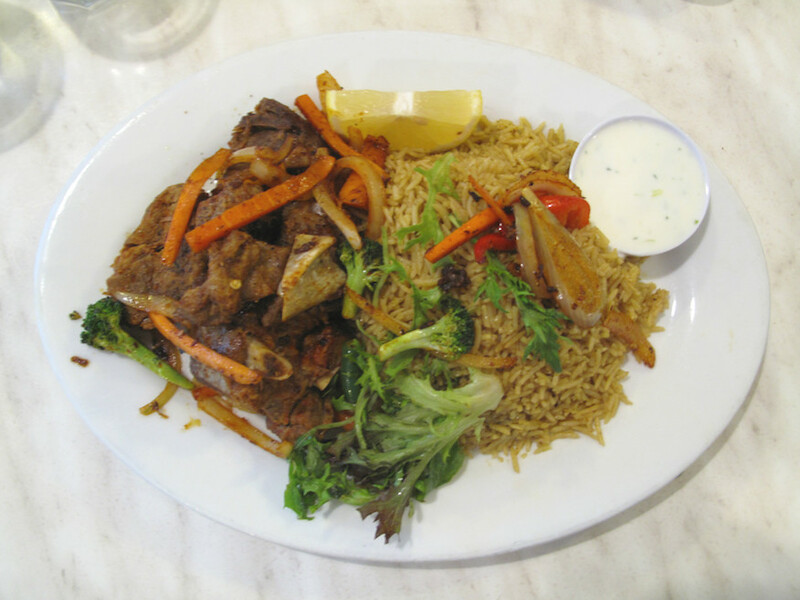 The lamb shank looks rather unlovely, but who cares when the meat is so tasty and succulent? Spiced yogurt and a fiery green chilli sauce are served on the side. Lamb shanks, of course, long ago left the realms of cheap cuts and quite often, in other places and contexts, can be quite expensive these days. So that makes this shank offering an outright bargain at $15. For the subsequent CTS House of Mandi outing, this time with the ever excellent company of Nat Stockley, the soup is just a good – but this time comes with noodles. We both opt for the non-shank lamb-on-the-bone in federation style, Nat with just mandi rice, me with mandi rice and pasta. Mandi, I’m told, is a Yemeni word meaning juice that in the rice context refers to the meat being placed on the rice as it cooks and the juices seeping down and through. 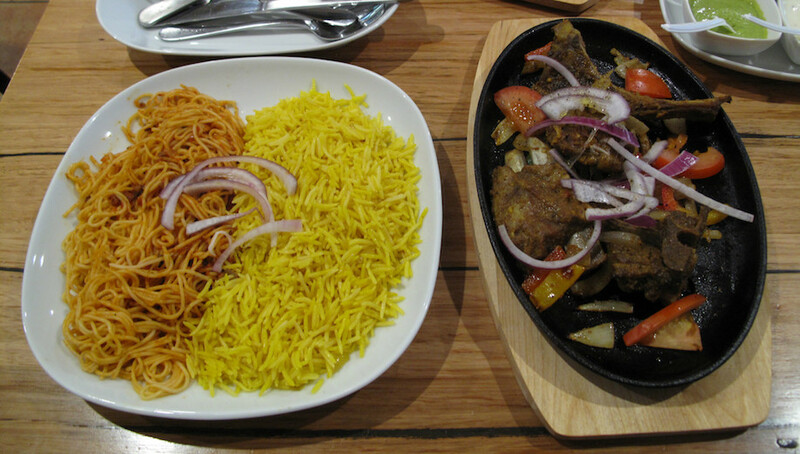 Truth be told, there’s little evidence of that here – but the vibrant yellow rice is still Somalian wonderful, with subtle perfuming. 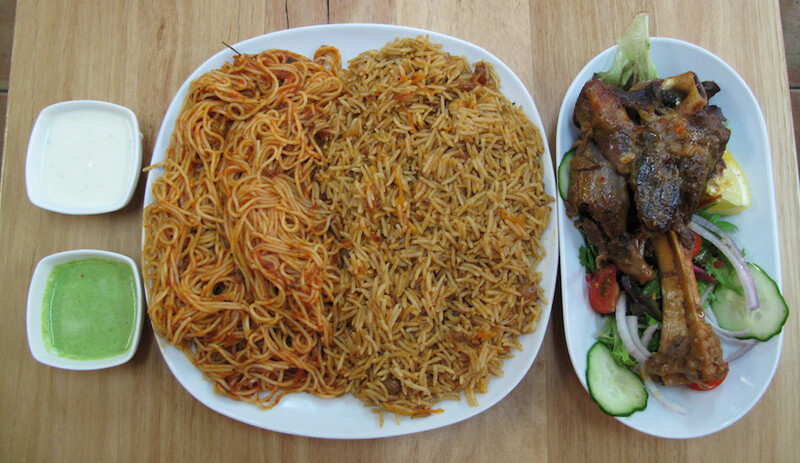 How wonderful is Somalian food when rice can be served in two such different yet equally toothsome ways? This sort of lamb is very familiar to CTS, but I’m never sure quite what precise nature it is going display. Here it is well cooked, some fall apart tender, some not-so-much, but all displaying yumminess of a high order. There’s even a couple of ribs in there. Following in the footsteps of shanks, lamb ribs have themselves become trendy in some quarters and, thus, correspondingly expensive. 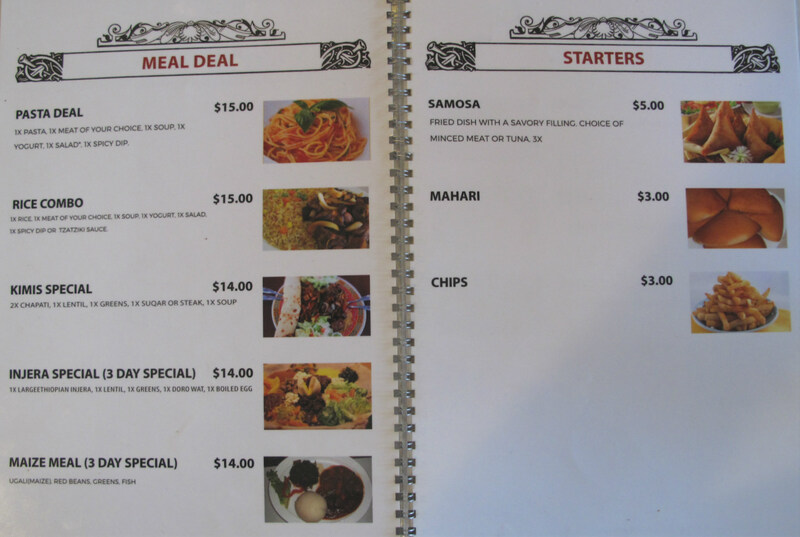 So, once again (familiar refrain), our meals are sooper dooper bargains at $15. There’s pan-fried veg under that meat to help liven our meals up even more, along with the familiar yogurt/chilli sauces and a good salad. 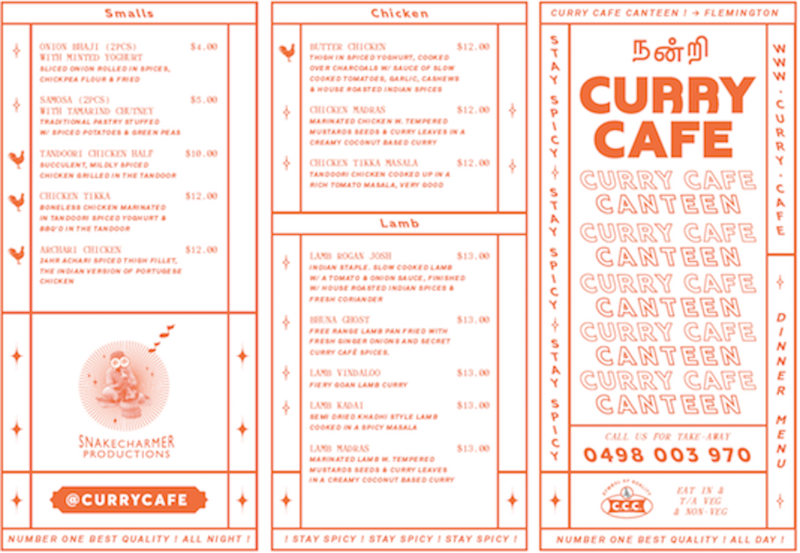 Curry Cafe Canteen is a new arrival that adds much colour and wonder to the already diverse offerings of one of our favourite food strips. 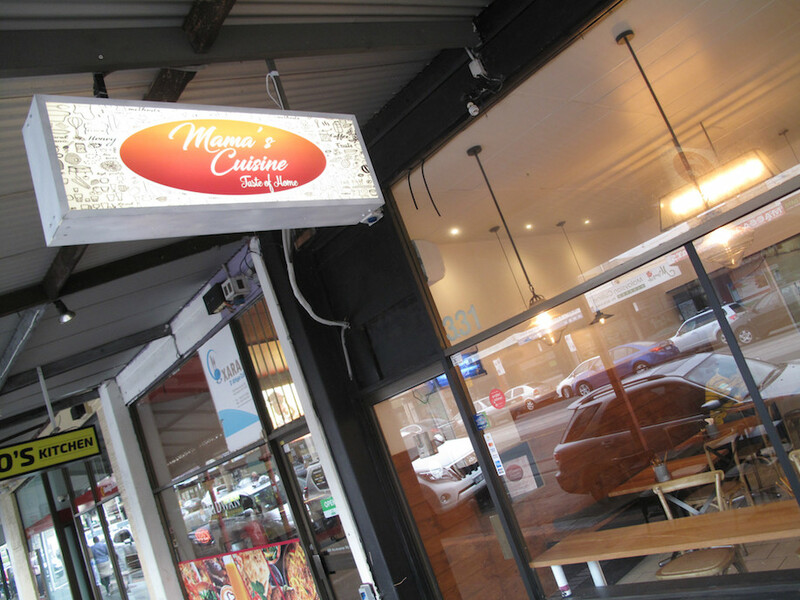 It’s an outpost of an already established Curry Cafe in Northcote, with the Flemington branch offering a bit more of an accent on Indian street food. 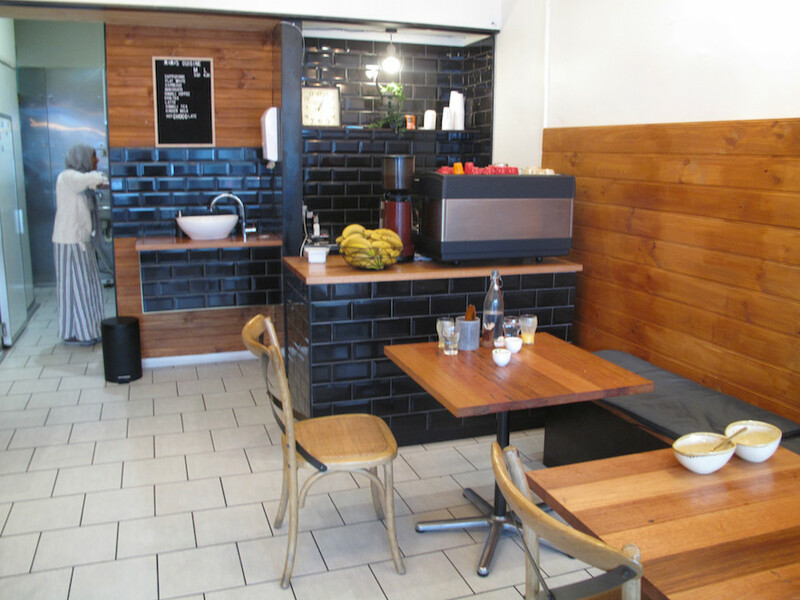 The place – done out in wood and stools, and very chic in a comfy way – has been open just a few days when we visit for a Sunday lunch, but has been doing Uber deliveries for a month or so on the back of the connection with the Northcote mothership. And – as we discover to our ecstatic delight – it is raising the bar for all Indian food offerings in the western suburbs. It’s not so much that the menu (see below) offers anything unusual, spectacular or innovative. It’s just that everything we try has the stamp of Indian cooking expertise all over it. Even better, there is a level of freshness and an exuberance of flavour that leaves most Indian places for dead – including many that are rather more expensive and famous. And they do it all at prices that fit, with room to move, into the cheap eats category. And there’s craft beer and organic wine on the way. 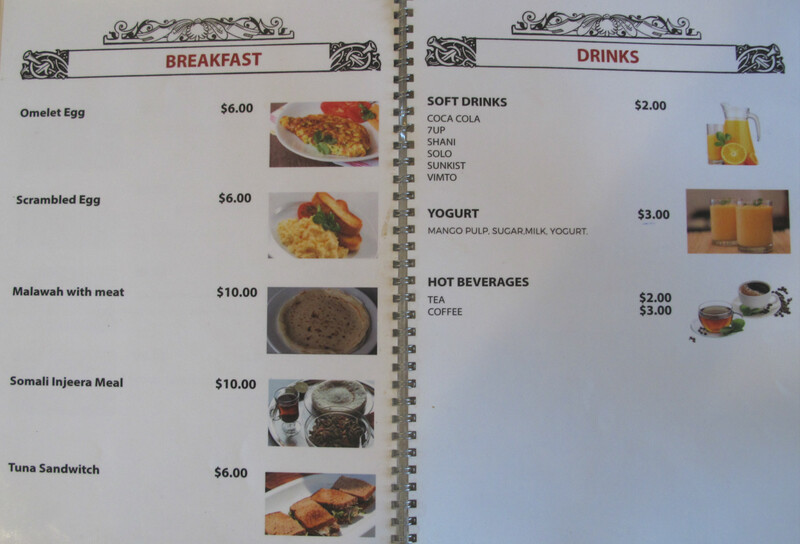 Take Bennie’s pav cholle ($8), for example. All to often, when we order an Indian snack dish the involves a chick pea curry, the curry is dull and appears and tastes tired. No such problem here – the chick pea brew is fresh and alive with vim. The buttered brioche rolls and kachumba salad are similarly fine. 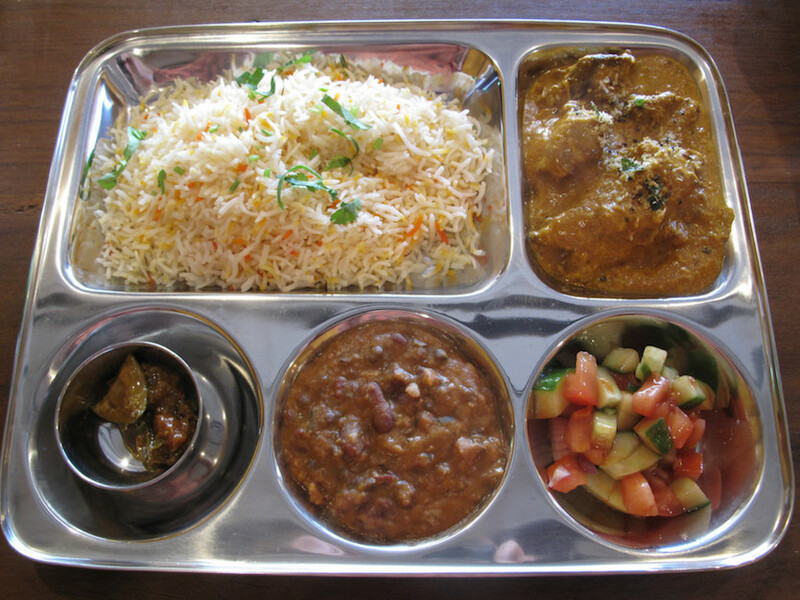 My thali ($12) comes with vibrant lamb madras that puts the meat curries served in most Indian places to shame. On board, too, are the same salad, a pappadum and rice. 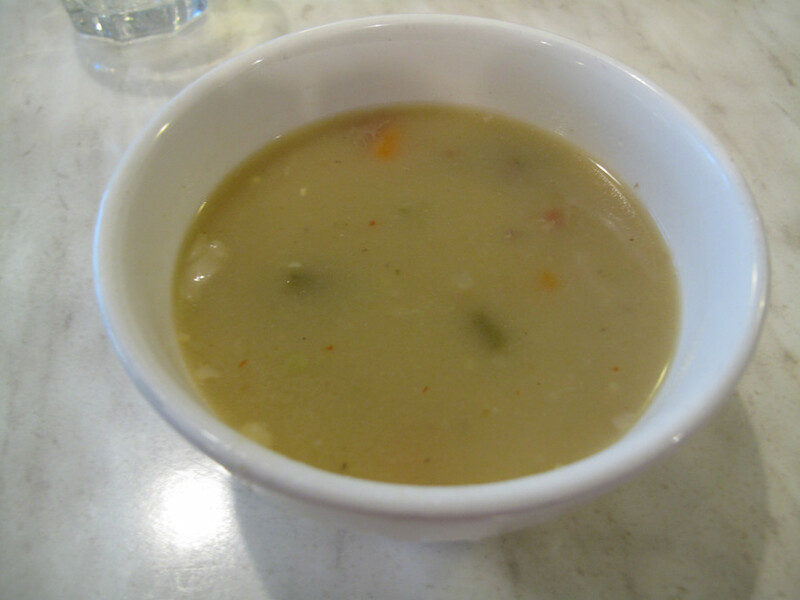 The pickles vividly illustrate, again, the freshness of the Curry Cafe Canteen food and the care put into it. I love the sour flavour boost that pickles give to an Indian meal, and am quite happy to accept commercial pickles. But so often those pickles involve a chunk of mango that is as tough as old boot. Here the pickles are made in house using lemon, lime, pepper, mango, lotus stem and garlic – and they’re soft. Another point of difference is the dal makhani. In most Indian eateries, this dish overloaded with cream. Not so here – it’s a way more austere and plain pulse offering, and all the better for it. While we’re about our Sunday lunch, we get some extras from the lunch menu. 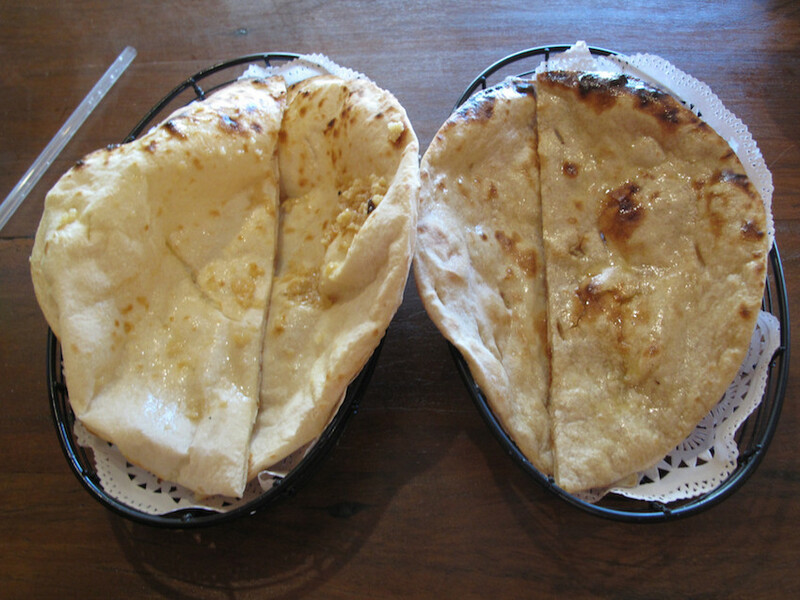 Garlic naan ($2.50) and roti ($2) are very good. 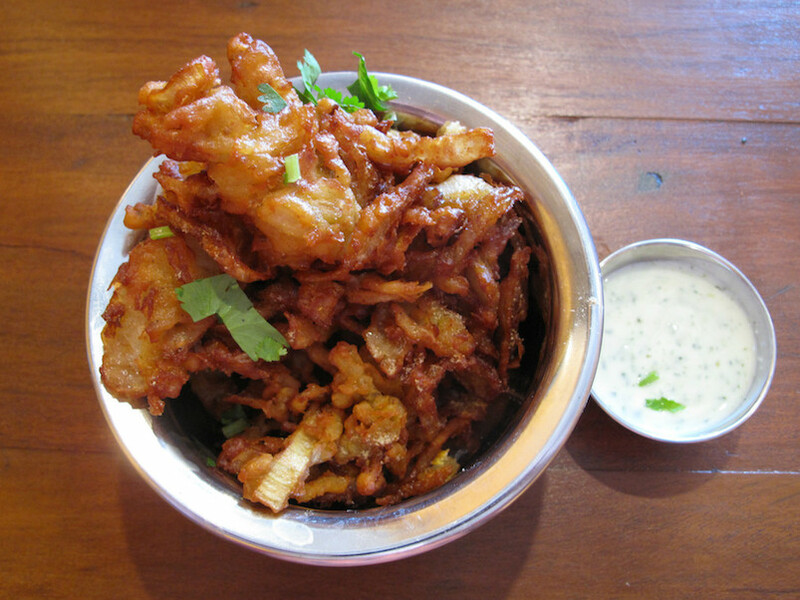 Onion bhajji ($3, top photo) are excellent Indian onion rings. 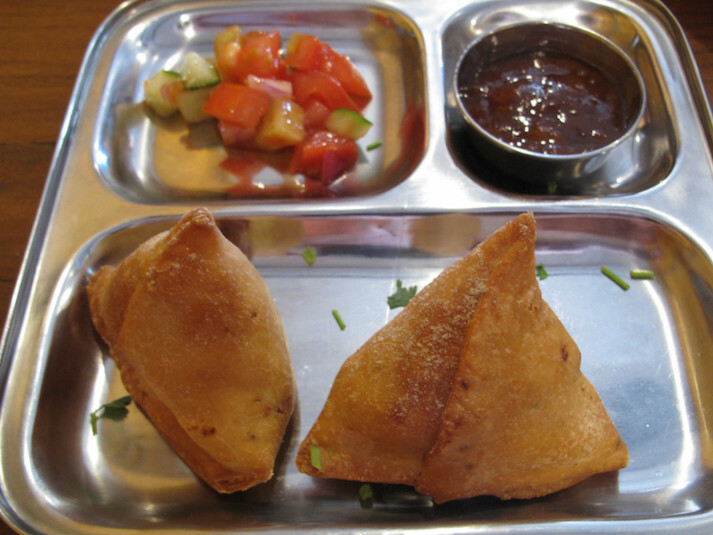 A serve of two smallish samosas ($3) again affirm the high quality of the food here. These are a bit more delicate than we’re mostly familiar with, expertly fried, have peas on board, are wonderful and are served with more of that salad and a nice tamarind chutney. 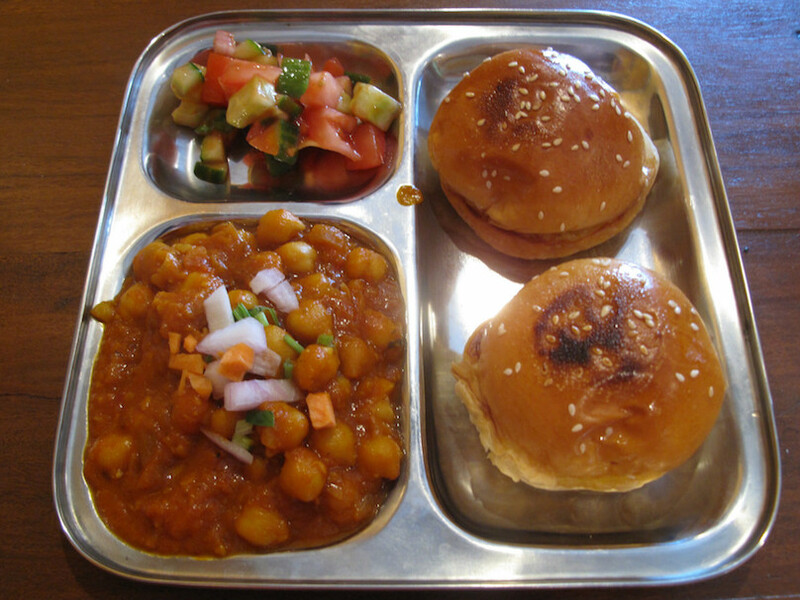 I’m told that the pav dishes and the thali set-up is available for lunch only. I reckon that’s shame as thalis are so very, very cool for those dining solo – as I often do. But the place is finding its feet, so could be open to persuasion in these regards. 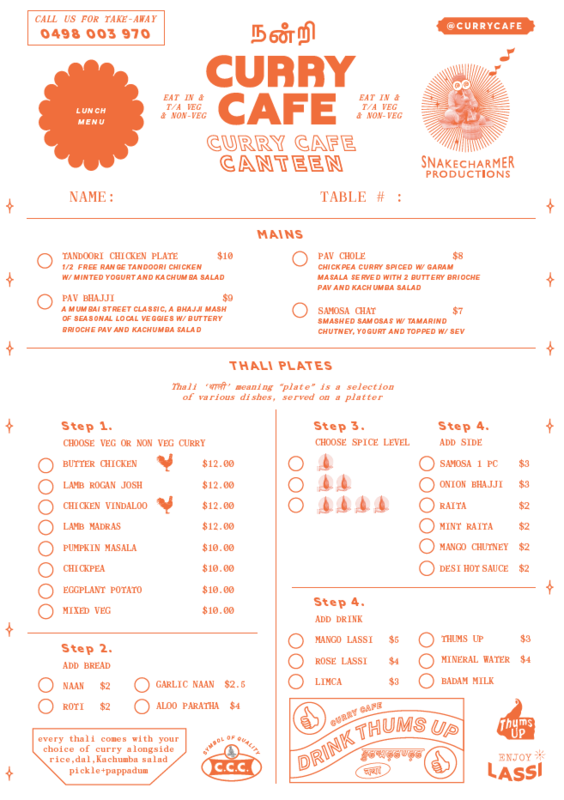 But even going a la carte with the evening menu will surely be a winner. After all, all curries are in the $10 to $13 range and half a tandoori chook costs $10.